Even with the VH-71 helicopter project permanently grounded, President Obama still has a number of egregiously expensive air transport options—such as the newly unveiled MV-22 Osprey—to choose from. The only problem is the MV-22 is that he's not actually allowed to ride in it. The Marine Corps MV-22 is a specialized derivative of the much anticipated (and heavily criticized) V-22 Osprey designed specifically for Marine Helicopter Squadron One, the air transportation unit charged with shuttling the President and top administration officials around the world. Like its combat-ready counterparts, which have already logged more than 10,000 flight hours in Afghanistan, the MV-22 is a tilt rotor aircraft capable of both vertical takeoffs and forward flight using a pair of rotating turboprops. The Osprey measures 54 feet long with a 45-foot wingspan. On each wingtip sits an 38-foot diameter, 3-blade composite rotor attached to a rotating nacelle that can swivel up to 90 degrees. A pair of 6,150 HP Rolls-Royce Allison T406/AE 1107C-Liberty turboshafts provide the thrust. This allows the powered lift aircraft (as it's classified by the FAA) to take off and land like a conventional helicopter when the nacelles are vertical, then convert into a more fuel-efficient turboprop plane once it's in the air by rotating the nacelles forward. It can also perform a hybrid rolling takeoff with the rotors at a 45-degree angle. The Osprey program began way back in the 1980s in response to the failed Iran hostage rescue. The most recent iteration, Block C, is capable of a 316 mph top speed, 879 mile range, and 25,000 foot service ceiling. That's roughly twice the speed, six times the range, and three times the lifting capacity of the president's current fleet of CH-46E's. The aircraft is manned by a crew of four—pilot, copilot and two flight engineers—and can carry as many as 32 troops or 20,000 pounds of cargo. Or, in the case of the President's jaunt to Martha's Vineyard last Saturday, a contingent of White House staffers, journalists, and Bo, the president's pooch. But not the president himself. No way, he's not allowed anywhere near this thing. During the Ospreys initial flight testing and development phase, the aircraft earned the nickname, "the Widowmaker," given its habit of falling out of the sky. In 2000, a pair of Osprey crashed, killing the crew of one, and the crew along with 15 passengers in the other. The aircraft were finicky and notoriously difficult to handle, even with experienced test pilots at the controls. The situation wasn't helped any when the program's senior officer, Lt. Col. Odin Lieberman, was relieved of command after an internal investigation discovered that he had instructed his team to falsify records to make the Osprey look safer than they actually were. Then there are the ongoing concerns with what happens if both engines shut down during a catastrophic failure. 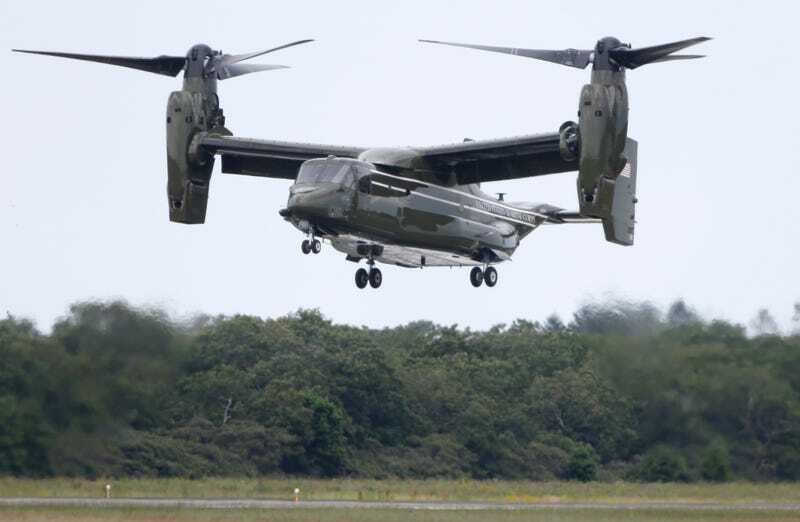 The aircraft can land using just one engine to drive both props at half power but with both engines kaput, the Osprey comes down about as gracefully as a sack of potatoes. A 2005 study of such a situation bluntly classified the prospects of landing as a helicopter below 1,600 feet as "not likely to be survivable." There is the possibility a crew could "turn it into a plane and glide it down, just like a C-130," as V-22 pilot Captain Justin "Moon" McKinney told Time magazine, however a majority of research has been towards training pilots to recognize and prevent vortex ring state (VRS)—wherein the aircraft dips into its own downwash and cannot generate enough lift to remain airborne—rather than hotdogging emergency landings. The Block C iteration has also done much towards minimizing these dangers through hardware and software upgrades.